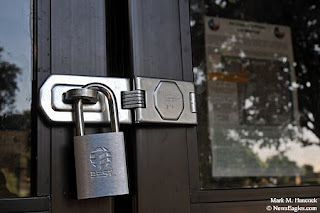 The old Collin County Courthouse Building remains padlocked in McKinney on Saturday, June 27, 2009. 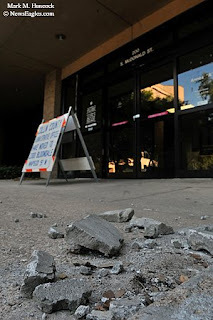 The sidewalk has crumbled outside the old Collin County Courthouse Building. 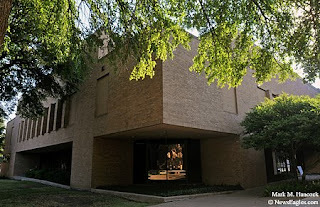 The Texas Historical Commission said the 30-year-old building has architectural significance and should be saved. The old Collin County Courthouse Building remains padlocked in McKinney. 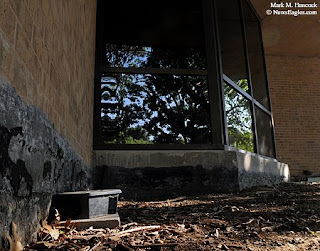 Rat traps remain around the old Collin County Courthouse Building. 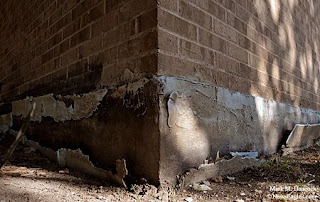 Flashing has been removed from the old Collin County Courthouse Building in McKinney. CASL Spartan's Stephanie Bronson (No. 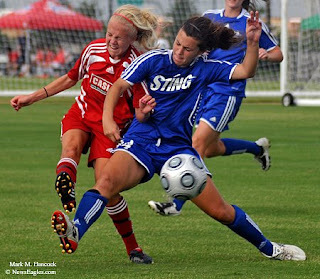 10, left) kicks the ball past Sting 92's Molly Richey (No. 14, right) during the US Youth Soccer Regional Championships at Pizza Hut Park in Frisco on Saturday, June 20, 2009. Sting 92's Emily Reid (No. 2, right) knocks the kick of CASL Spartan's Taylor Travis (No. 41, left) out of bounds during the US Youth Soccer Regional Championships at Pizza Hut Park. 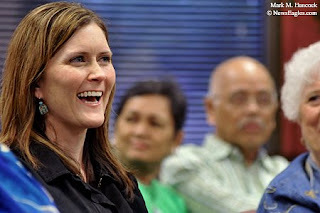 CASL Spartan's Jennifer McGorty (No. 31, left) and Sting 92's Sydney Miller (No. 10, right) head the ball as CASL Spartan's Stephanie Bronson (No. 10, bottom) puts on the brakes during the US Youth Soccer Regional Championships in Frisco. CASL Spartan goalie Madison Winter (No. 21, bottom) and Sting 92's Lauren Byers (No. 18, middle) both fall down during a collision as CASL Spartan's Morgan Tilley (No. 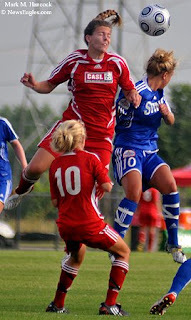 19, top) leaps away during the US Youth Soccer Regional Championships. Sting 92's Danielle Nottingham (No. 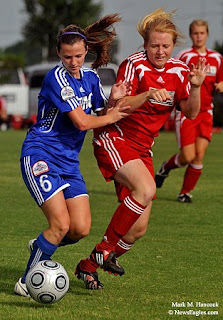 6, left) pushes CASL Spartan's Kelsey Gauger (No. 11, right) away from the ball during the US Youth Soccer Regional Championships. 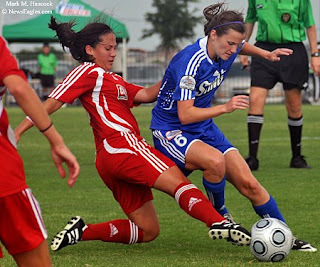 CASL Spartan's Jessica Crowder (No. 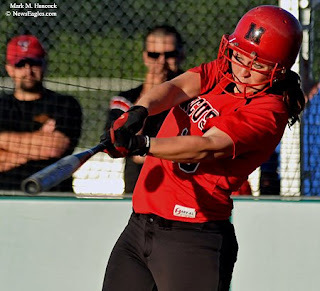 13, left) slides into a ball controlled by Sting 92's Danielle Nottingham (No. 6, right) during the US Youth Soccer Regional Championships at Pizza Hut Park in Frisco. The game ended with a 1-1 tie. Alondra de la Parra guest conducts the Dallas Symphony Orchestra as part of the DSO's Latino Festival Concert at the Morton H. Meyerson Symphony Center in Dallas on Saturday, June 13, 2009. 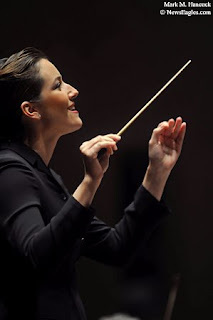 Alondra de la Parra guest conducts the Dallas Symphony Orchestra. De la Parra is the founder and artistic director of the Philharmonic Orchestra of the Americas, which promotes young composers and soloists from the Americas. 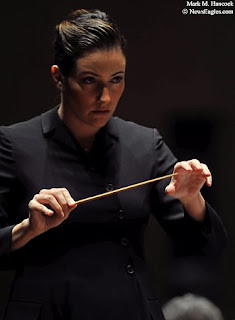 Alondra de la Parra guest conducts the Dallas Symphony Orchestra as part of the DSO's Latino Festival Concert at the Morton H. Meyerson Symphony Center. 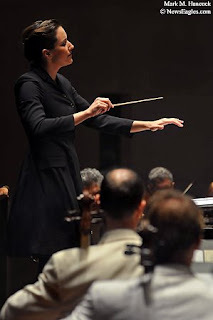 Alondra de la Parra guest conducts as part of the DSO's Latino Festival Concert. 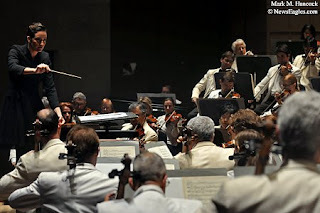 Alondra de la Parra guest conducts the Dallas Symphony Orchestra as part of the DSO's Latino Festival Concert at the Morton H. Meyerson Symphony Center in Dallas. Plano East's Taylor Jones (No. 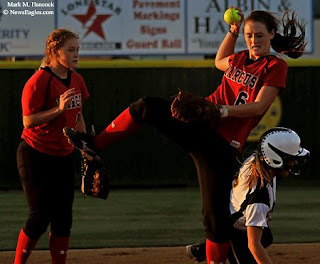 16, right) pitches against Flower Mound Marcus' Kacie Hildreth (No. 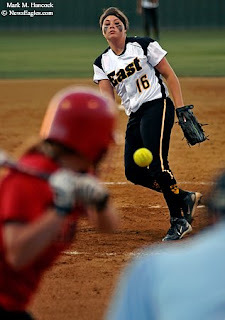 17, left) during a 5A regional final softball game in Frisco on Wednesday, May 27, 2009. Flower Mound Marcus' Devon Wallace hits a single against Plano East during a 5A regional final softball game in Frisco. Plano East's Rachel Scott (No. 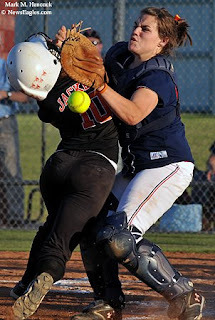 9, right) skirts around Flower Mound Marcus' Kacie Hildreth (No. 17, left) and gets safely to 2nd base during a 5A regional final softball game. Although out, Plano East's Chandler Cink (No. 5, right) keeps Flower Mound Marcus' Courtney Flanary (No. 6, center) off balance and allows a teammate to get to 1st base during a 5A regional final softball game in Frisco. Texas' Josh Turley (No. 14) pitches against Heath during a 4A baseball playoff game at Rockwall-Heath High School in Heath on Friday, May 29, 2009. 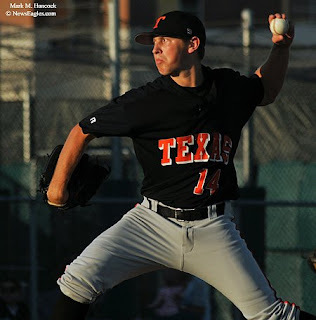 Texas' Logan Preston (No. 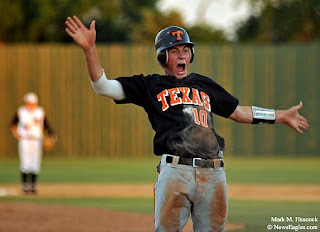 10, right) celebrates the team's 9th unanswered score during a 4A baseball playoff game against Heath at Rockwall-Heath High School. Texas High School of Texarkana won the first game of the best-of-three series over Rockwall-Heath High School. It only took five more innings to win the series. Fr. Jullius Leloczky celebrates a Hungarian mass at Our Lady of Dallas Cistercian Abbey in Irving on Sunday, June 28, 2009. The Hungarian-language mass is held on the last Sunday of each month. Also named in this slideshow are: Fr. Matthew Kovacs and Gabor Kovats. Fr. Clair Antonio Orso celebrates a Portuguese mass at St. Luke's Catholic Church in Irving on Saturday, June 21, 2009. Fr. Orso is originally from Brasil. The mass is held weekly. Also named in this slideshow are: Luis Furtado, Renato Pazzini and Neuza Pazzini. Bishop Kevin J. Farrell celebrates with parishioners during the 10th anniversary mass at the Sacred Heart of Jesus Christ Catholic Church in Carrollton on Saturday, June 20, 2009. The primarily Vietnamese church celebrated with a reception afterward. Also in this slideshow are: Fr. Joseph Son Van Nguyen, Fr. Dominic Nguyen, Sr. Jacinta Tran, Sr. Leslie Dao, Win Nguyen, Tam Nguyen, Poline Dang, Canh Nguyen, Madalena Nguyen, Catherine Nguyen. Guests attend The First Mass of Thanksgiving of Rev. Fr. Vincent Chinaka Anyama at St. Joseph Catholic Church in Richardson on Sunday, June 14, 2009. Fr. Vincent was ordained to the priesthood on Saturday, June 13, 2009. He plans to travel to Nigeria before before beginning his assignment in Frisco at St. Francis of Assisi. Also in this slideshow are: Bishop Daniel Flores of the Detroit Archdiocese, The Nigerian Choir, Knights of Columbus and Mary Anyama. Fr. Vincent Anyama participates in the Rite of Ordination To The Priesthood ceremony at the Cathedral Shrine of the Blessed Virgin Mary of Guadalupe in Dallas on Saturday, June 13, 2009. He celebrated his first mass as a priest the next day. Also named in this slideshow are: Bishop Kevin J. Farrell of the Dallas Diocese, Bishop Daniel Flores of the Detroit Archdiocese, Fr. 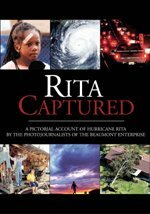 T. Michael Dugan, Mary Anyama, Magnus Anyama, Marco Rangel, John Szatkowski, Sr. Joanna Okereke, Fr. Ferdinand Madu and Fr. Rudolfo Garcia. Rockwall's Audrey Farfan (No. 7) hits the ball during a 4A softball playoff game against Mesquite Poteet at Wylie High School in Wylie on Saturday May, 23, 2009. Mesquite Poteet's Jordan Hartsell (No. 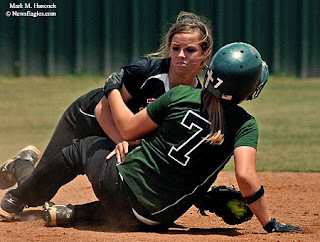 1) gets caught in a squeeze play from Rockwall's Haley Lemons (No. 16), Kat Brown (No. 18) and Ashton Atwell (No. 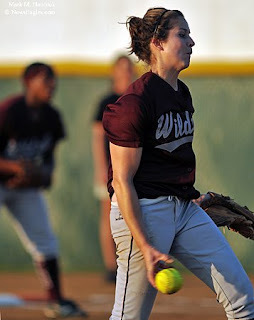 12) during a 4A softball playoff game at Wylie High School. 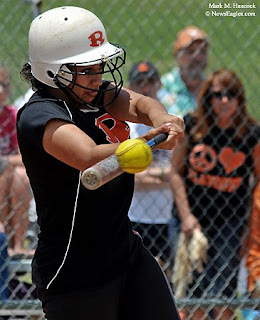 Rockwall's Haley Lemons (No. 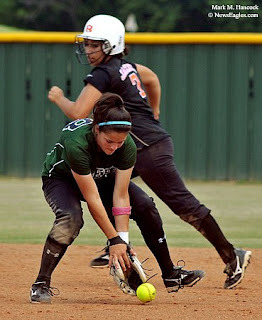 16, left) sprints for 1st base as Mesquite Poteet's Bradie Baker (No. 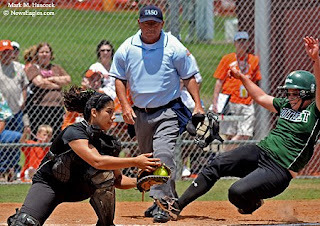 20, right) moves for the throw out during a 4A softball playoff game in Wylie. Rockwall's Cyndi Bertrand (No. 2, left) reaches for a ball as Mesquite Poteet's Lindsey Barsoum (No. 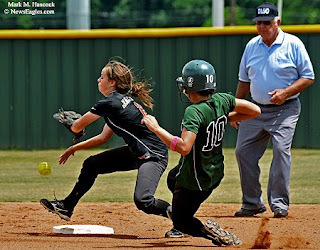 10, right) starts a slide into 2nd base during a 4A softball playoff game. Mesquite Poteet's Jessi Black (No. 7, bottom) slides safely under Rockwall's Cyndi Bertrand (No. 2, top) during a 4A softball playoff game at Wylie High School. 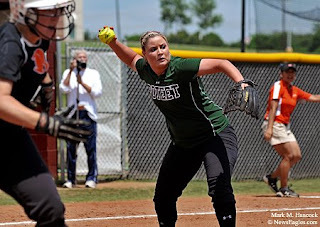 Mesquite Poteet's Mackenzie Middlebrook (No. 28, bottom) misses a throw as Rockwall's Audrey Farfan (No. 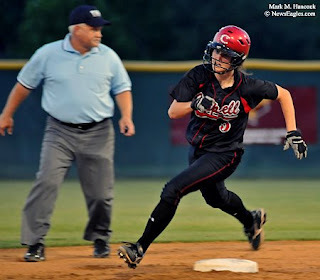 7) sprints to 3rd base during a 4A softball playoff game in Wylie. Rockwall's Shelby Frierson (No. 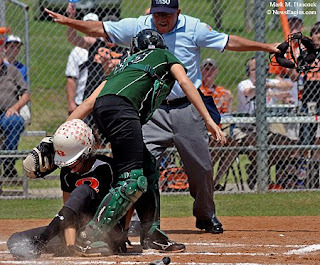 3, bottom) is called safe as Mesquite Poteet catcher Brenna Wright (No. 13, center) tries to get the tag during a 4A softball playoff game at Wylie High School. Rockwall's Audrey Farfan (No. 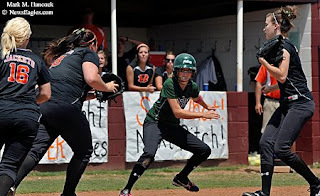 7, left) keeps a foot on the plate as Mesquite Poteet's Bradie Baker (No. 20, right) is forced out at home during a 4A softball playoff game at Wylie High School in Wylie. Coppell's Peyton Mosley (No. 3) pitches against Plano during a 5A softball playoff game at Plano Senior High School in Plano on Friday May, 15, 2009. Plano's Macy Burr (No. 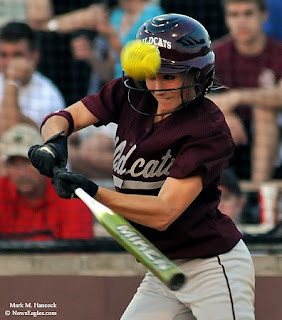 1) hits a pitch during a softball playoff game against Coppell at Plano Senior High School. Plano's Abbi Frakes (No. 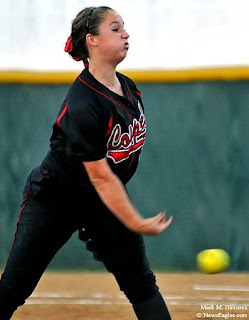 5) pitches against Coppell during a softball playoff game at Plano Senior High School. Coppell's Rachel Forshaw (No. 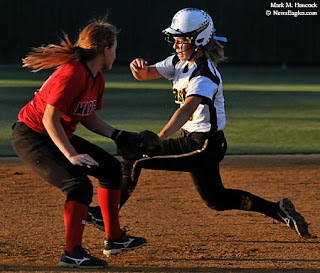 5) rounds second base during a softball playoff game against Plano at Plano Senior High School. Rockwall's Amanda Harmon (No. 10, left) smashes into Frisco Centennial's Kristen Hill (No. 12, right) at home plate during a 4A Regional Quarterfinal softball playoff game at Wylie High School in Wylie on Tuesday May, 19, 2009. Rockwall's Amanda Harmon (No. 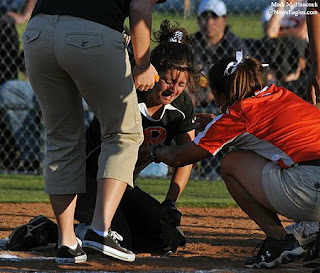 10, center) cries as she finds part of her tooth at home plate after a collision with Frisco Centennial's catcher during a 4A Regional Quarterfinal softball playoff game. Harmon scored, but lost part of a tooth. Rockwall won the series and advanced. 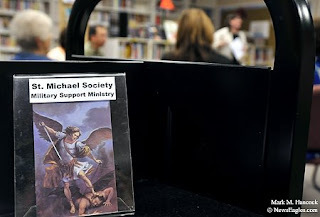 A small sign welcomes visitors during a St. Michael Society meeting at St. Mark the Evangelist church in Plano on Sunday, May 3, 2009. The organization supports active duty military personnel and their families. Elizabeth Marquez signs up for an organizational duty during a St. Michael Society meeting at St. Mark the Evangelist church. 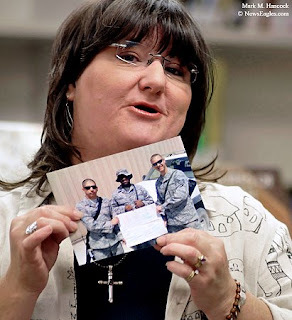 Ellen Ray, a St. Michael Society leader, holds up a photo of thankful airmen during a society meeting in Plano. Tanya Johanson, a society leader at St. Paul in Richardson, (left) laughs during a St. Michael Society meeting at St. Mark the Evangelist church in Plano. 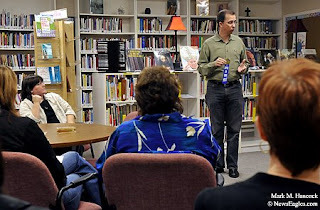 Andy Ray (top) explains how support ribbons work during a St. Michael Society meeting in Plano. 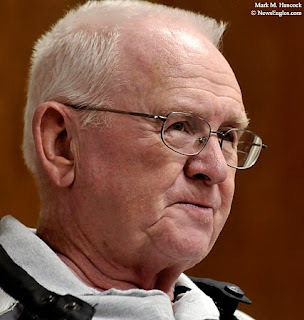 Joe Vaughn participates during a St. Michael Society meeting at St. Mark the Evangelist church. 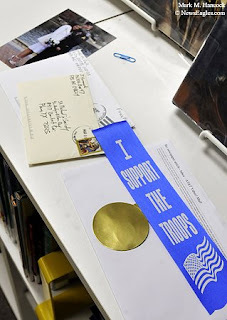 Letters and photos from thankful care package recipients are shared during a St. Michael Society meeting at St. Mark the Evangelist church. 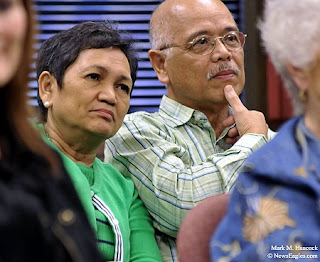 Elizabeth Centeno (left) and Peter Centeno (right) listen during a St. Michael Society meeting in Plano. 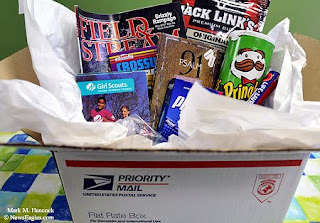 A sample care package is displayed during a St. Michael Society meeting at St. Mark the Evangelist church in Plano. The organization solicits funds from church members to finance care packages for troops stationed worldwide. Please visit the organization's Web site to help or learn more.